Valentines Day 2016. | A.B.E. Remodeling, INC.
Well here we are reflecting on February 14th, the day of Love. Let's highlight on some facts. Did you know that nearly 150 million cards are exchanged each Valentine's Day? Here's lots of reading on the subject. We just want to say HAPPY VALENTINES DAY TO YOU ALL. HOW ABOUT A REALLY SPECIAL GIFT TO EACH OTHER LIKE UPDATING, OR REMODELING YOUR HOME...OR GETTING SOME OF THOSE NEEDED REPAIRS DONE. GIVE US A CALL-WE CAN HELP. While the history of Valentine's Day is sometimes debated, it clearly links back to a Catholic saint named St. Valentine. The problem is there are actually three St. Valentine's -- one a priest, one a bishop, and little is known about the third. All were martyrs. In 469 A.D., Pope Gelasius declared Feb. 14 a day to honor St. Valentine, one of these three men. One legend says that a Roman emperor banned soldiers from marrying in the third century, but St. Valentine took issue with this. He became an advocate for soldiers and was executed as a result of his outspokenness. Another legend says St. Valentine was executed for his beliefs in Christianity and just before he died, he left a farewell note for a loved one and signed it "From Your Valentine." A conventional and widely accepted belief about the holiday itself is that Valentine's Day grew out of a Middle Ages tradition of celebrating Feb. 14 as the day "the birds began to pair." History.com notes that February has long been associated with being a month of love, and Feb. 15 was celebrated in ancient times as a fertility festival. 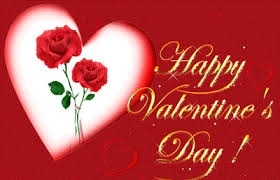 Whatever its origin, it took off, and the U.S. Greeting Cards Association estimatesValentine's Day is the second-most popular card-giving day of the year, only to Christmas. 61 Lovely Facts About . . .
a Aveni, Anthony. 2003. The Book of the Year: A Brief History of Our Seasonal Holidays.New York, NY: Oxford University Press. b "Condom Sales Rise Ahead of V-Day." ThaiIndianNews. February 9, 2010. Accessed: January 19, 2011.
c Graham-Barber, Lynda. 1991. Mushy! The Complete Book of Valentine Words. New York, NY: Bradbury Press. d "Hindu and Muslim Anger at Valentine's." BBC News. February 11, 2003. Accessed: January 8, 2011.
e "Historical Events on February 14." His-Dates.com. 2010. Accessed: January 9, 2011.
f "Iran Snubs Valentine's Day." The Washington Post. January 2, 2011. Accessed: January 8, 2011.
g Linder, Melanie. "Valentine's Day around the World." Forbes. February 11, 2009. Accessed: January 8, 2011.
h "Man Set Valentine Suicide Pact." BBC News. February 12, 2005. Accessed: January 8, 2011.
i McKay, Mary Jayne. "Alone? Celebrate Anyway." CBS News. February 13, 2003. Accessed: January 5, 2011.
j Rau, Dana Meachen. 2001. Valentine's Day. New York, NY: Scholastic Inc.
k Sullivan, Meg. "Henry Ansgar Kelly, Valentine's Day." UCLA Spotlight. February 1, 2001.
l Thompson, Sue Ellen. 2000 (2nd Ed.). Holiday Symbols. Detroit, MI: Omnigraphics, Inc.
m "World Record Valentine's Day Kiss." World Breaking Record. January 2010. Accessed: January 8, 2011.
n "Valentine's Day Floral Statistics." Aboutflowers.com. 2010. Accessed: January 8, 2011.
o Yamey, Gavin. "Pfizer to Sponsor European Impotence Awareness Day." BMJ. March 2000. Accessed: January 19, 2011.